Technology is critical to the District’s goals because of its capacity to support student achievement and transform the traditional classroom. When used appropriately, classroom technology can provide students and teachers with tools for dynamic exploration and representation of data and information, experimentation, problem solving, social and global awareness, independence, effective communication and collaboration, confidence, and a positive orientation to the future. However, District administrators and decision makers must make concerted efforts to remember that technology is merely a means to enhance the education of students rather than an end in itself. Technology must be part of a multi‐faceted curriculum that allows students and teachers to carry out the process of education in a powerful and effective manner. There are two models of integration that will be the focus of the District's deployment and professional development plans. These are the Technological and Pedagogical Content Knowledge (TPACK) and SAMR Models. 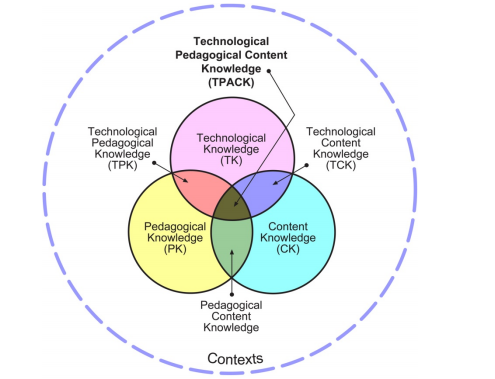 The TPACK model emphasizes the relationship between content, pedagogy and technology, identifying the knowledge needed to teach effectively with technology. The image below illustrates the important relationship between the three knowledge bases and the belief that effective integration does not occur in isolation. 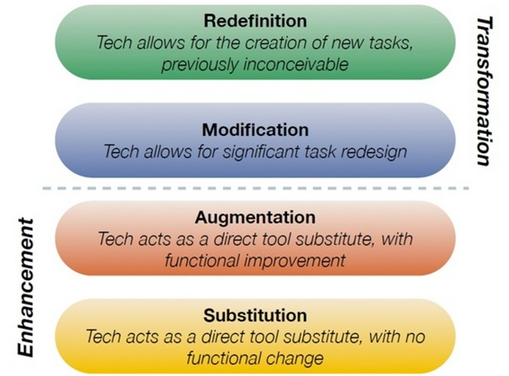 The SAMR Model, when used as a reflective teaching tool for teachers to evaluate how they are incorporating technology into their instructional practice, will guide the transformation of the learning experience for ALL students by providing opportunities that would otherwise be unattainable.